Islandista: DRAMA at Soca Royale!!! Wow. Facebook and the streets are hot with the fiasco that was the inaugural Soca Royale contest today at Barbados' Bushy Park racing circuit. What a strange and sorry (non) spectacle it turned out to be. What can we say about it? Well, after her emphatic at-last win last year, 2010 turned out to be a very different year for TC. She won at Bushy Park today, succesfully and strongly defending her Sweet Soca crown with a not very popular tune - Down the Road. 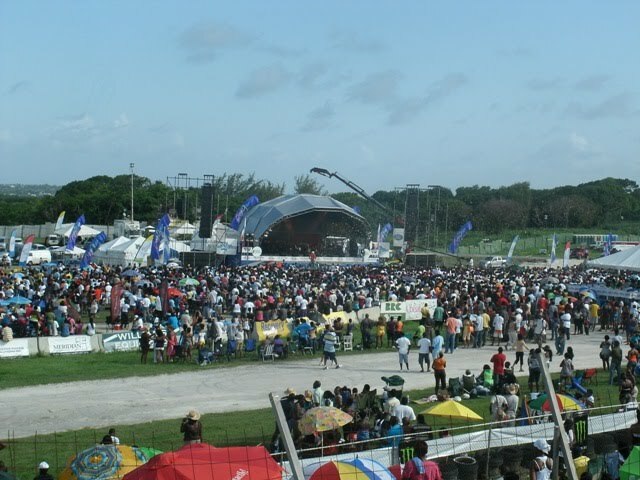 The crowd was already against her from about half an hour earlier when she was announced as the winner of the Sweet Soca contest - booing loudly and harshly. Apparently 98.1 The One even had to cut their live programming for a while, is so people were getting on. Now, our take on it? Let's face it, TC is not the most popular character - people have long had her classed up as abrasive and rude. We don't know her and we cannot judge that - all we will say is we all know women are judged more harshly than men. Pair that with the fact that her song was not the most popular tune going in. But! People often mistake the Party Monarch and Sweet Soca Monarch contests for popularity contests. They are not. That is the Road March. That is why traditionally the Party Monarch and Road March King or Queen often don't even end up being the same person - anywhere in the Caribbean. The most popular song does not have to win - the person with the best performance on the day is who is to win. And TC had the best performance in the Sweet Soca contest. Hands down. She came out like a woman on a mission and lifted an 'aight' song with a big, big performance. After she performed, everyone I spoke to was impressed and had her to win. She deserved to retain her crown. But people didn't feel so. And they made their feelings known. It would have been difficult for the most lion-hearted performer to step back out onto the stage with the way people were carrying on. Pair THAT with the fact that TC had already made it a matter of public record that she thought the Soca Royale concept was a bunch of boo. On CBC's Festival Stage she told Admiral Nelson that the idea of pitting groovy soca against fast-paced soca was a non-starter as the former could rarely ever compete with the latter in moving a crowd - which was one of the main qualifications for winning the brand new Ford Focus that was the grand prize. And others agreed with her. I know people will say that if she had such a huge problem with it she could have "just not entered" but she was the defending monarch firstly and secondly the point would not have been made as emphatically as it has been...look at your status updates its what everyone is talking about and believe me it WILL cause the event's organisers to really rethink it. So to that I say GOOD JOB TC!! There is also the inevitable talk that she forfeited in shame and hurt at the reaction of the crowd. The truth is likely to be somewhere in between those two when it eventually unfolds but certainly, this fiasco will have to force the NCF to rethink their awkward concept.